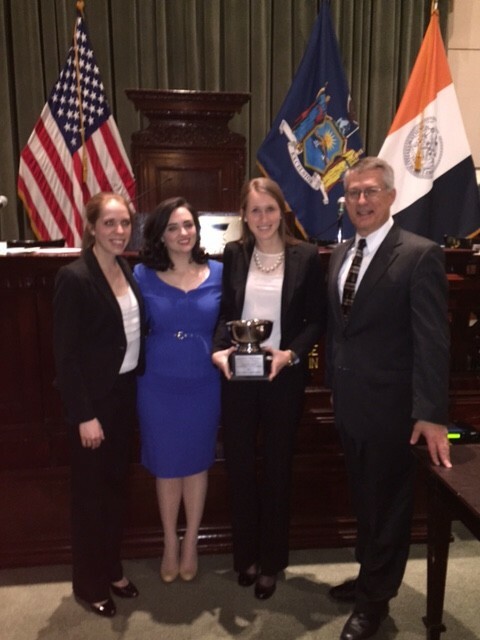 The Wake Forest National Moot Court Team of Karon Fowler (’15), Caroline Massagee (’15) and Kelsey Meuret (’15) competed successfully in the 65th Annual National Moot Court Competition during the week of Feb. 9, 2015, in New York City. The team was a semi-finalist (Final Four) and won the Runner-Up Best Brief award, out of the best 30 teams in the country, according to Professor John Korzen, the team’s faculty coach. The competition began last semester with 175 teams from 123 law schools, divided into 15 regions. The top two teams from each region advanced to New York City for the national finals. The Fowler-Massagee-Meuret team won the Region IV championship held in Richmond, Va., in November. It was the third time in six years that a Wake Forest team advanced from Region IV to New York, according to Korzen. In New York this week, the team went 2-0 in the preliminary rounds on Monday and Tuesday, defeating teams from Florida and Iowa. On Wednesday, the team defeated a team from Oklahoma in the Sweet Sixteen and a team from St. John’s in the Elite Eight. On Thursday, the team narrowly lost a semi-final round to a team from George Washington, which then defeated a team from Georgetown to win the national championship. Thus the Fowler-Massagee-Meuret team went 4-1 and lost only to the national champion. By advancing to the Final Four out of 175 teams, the Fowler-Massagee-Meuret team went further in the New York finals than a Wake Forest team has gone in many years. The team had six formal practices leading up to the New York finals and wishes to thank the judges for those rounds: Professor Walker, Dylan Greenwood (’13), and third-year students Derek Bast, Kathleen Bradway, Mike Klotz, Andrew Parrish, Davis Phillips, Jasmine Pitt, Gustin Vandiford, Zach Walters, and Ashley Waring. “Congratulations again to the fantastic team of Karon Fowler, Caroline Massagee and Kelsey Meuret,” Korzen said.